Choosing the bridesmaids' bouquets is only a small part of the overall decision making process for a bride organizing her big day. It can be an added stress, or it can be an easy task depending on the methods used in making the choice. If you follow certain decision making steps, then learning how to choose flowers for the bridesmaids' bouquets can be a pleasant experience. Consider your budget when choosing bouquets for bridesmaids. There are so many options available that you don't have to pay a fortune to get something nice. A unique idea is to pick a flower from your personal bouquet arrangement and have your bridesmaids carry one or three of that prominent flower, whether it is a rose or a lily. Coordinate your bridesmaids' flowers with your own. This does not mean that they have to have the same arrangement as you, but it does mean that their bouquets can be a smaller version of yours or that their flowers are the same as yours. For example, your personal arrangement can be a cascading style incorporating red roses and ivy, and their bouquets can be hand held bunches using the same flowers. Don't let them outshine you, whatever you decide. Your bridesmaids' bouquets should be smaller than yours. Consult your bridesmaids for their opinions regarding bridesmaid flower choices, although this can be a slippery slope if you have opinionated bridesmaids. The best way to approach this is to narrow the flower choices to what you want and then ask for their input. Pick the perfect color. What is the prominent color of your bouquet? Do you want your bridesmaids' dresses to match that or do you want them to contrast yours by maybe picking up a less prominent color in your bouquet? Do you want their bouquet to match their own dresses, or again, contrast them? 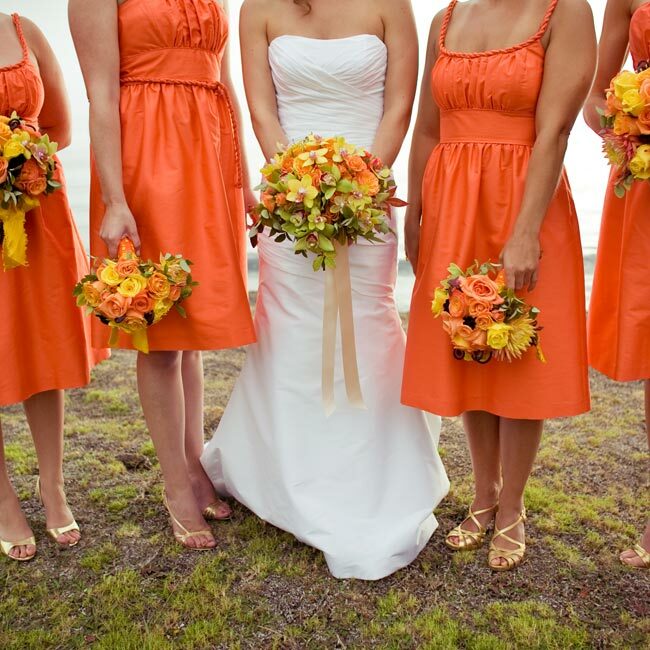 Choose the right size bouquets for your bridesmaids by coordinating them with the size of the people holding them. You want to make sure that the bouquet you choose does not overwhelm the carrier. The bouquet should be just one part of the full ensemble that includes the dress, shoes, and person, but should not make your bridesmaids invisible. Determine the style of bouquet you want for your bridesmaids by matching it with the style of dress they are wearing. Again, if the dress is simple, so should be the bouquet. However, if the dress is sleek and only one color, you can afford to have a bouquet that incorporates a few colors. A complex style dress should not have an equally busy bouquet since the ensemble as a whole will look too pretentious. The goal is to coordinate the flowers with the bridesmaids' dresses so that they balance in an aesthetically pleasing fashion. Remember that your bridesmaids' bouquets need to fit in with the wedding party's floral choices as a whole, and this does not just refer to your bouquet, but also that of the maid of honor, assuming hers is different from the bridesmaids, and the ushers' boutonnieres. In addition, they should complement the dresses and tuxes of your party. Remember that the more attendants you have, the simpler you should keep the bouquets so that the overall picture of your wedding party is not overwhelmed by flowers.